In this chapter, we are going to look at the story of the cognates Eng. insect ~ Sp. insecto, as well as that of their Latin and Greek source-words and other words in both languages that contain their roots, namely Latin sec‑/sect‑ and Ancient Greek tem‑/tom‑. The Latin source-word of Eng. insect ~ Sp. insecto is also an excellent example of a word that is derived by ellipsis from a phrase and of calquing or loan translation (cf. Part I, Chapter 1). The Romans borrowed many Greek words into Latin (cf. Part I, Chapter 8), but they also sometimes engaged in loan translation or calquing of Greek complex (multi-part) words or phrases. Lat. insĕctum ‘insect’ was an ellipsis of the phrase animal insĕctum, lit. ‘segmented animal’, that is, ‘animal with a segmented (cut into) body’. In other words, insĕctum was originally an adjective, which turned into a noun (was nominalized) after the noun it modified was dropped (cf. Part I, Chapter 5, §5.9, §5.10.5). But the phrase Lat. animal insĕctum for these arthropod animals was a loan translation from the equivalent Greek phrase ζῷον ἔντομον, from ζῷον (zôion) ‘beast’ and ἔντομον (éntomon), neuter nominative singular of ἔντομος (éntomos) ‘cut in pieces, cut up’. In Greek too, this word could be shorted to ἔντομον (éntomon) by elision of the noun. 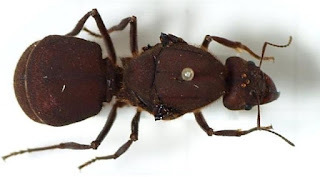 The reason for these peculiar phrases and hence the names for these animals in Greek and Latin is, obviously, that the bodies of some insects clearly seem to be cut up into sections, that is, head, thorax, and abdomen, as you can see in the picture of the ant in Figure 109 below. Lat. insĕctum ‘cut into’ was originally the neuter form of the passive participle (and derived adjective) of the verb insĕcāre ‘to cut into, make incision in’. This verb was formed with the prefix in‑ ‘in(to)’ and the verb sĕcāre ‘to cut, slice, divide’. As we will see, there are a number of words derived from this verb’s root sĕc‑ and its passive participle stem sĕc‑t‑ in both English and Spanish. The word for ‘insect’ in Ancient Greek ἔντομον (éntomon) is not etymologically related to Lat. insĕctum and thus contains a different root, but the two words are related by meaning and by how they came to mean ‘insect’, as we just saw. The root of this word is the variant ‑τομ‑ (‑tom‑) of ‑τέμ‑ (‑tem‑), which is found in the verb τέμνειν (témnein) ‘to cut’. As we shall see, a number of words in English and Spanish contain that root as well. We will begin our study with an analysis of the Greek word for ‘insect’. It is not clear if the first of these words, Lat. sĭgnum, comes from the PIE root *sek‑ ‘to cut’ or from the PIE root *sekw‑ ‘to follow’. 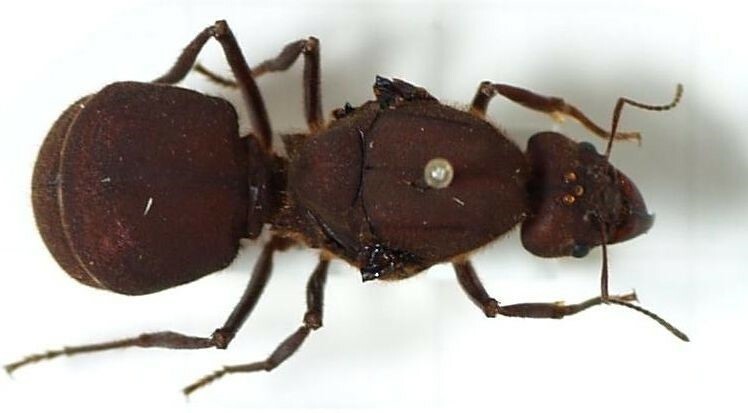 [i] Source: modified version of https://commons.wikimedia.org/wiki/File:Atta.cephalotes.gamut.jpg; description: Atta cephalotes; author: Sarefo; date: 19 September 2007.